Luckily Mäni's on Fairfax saved me! 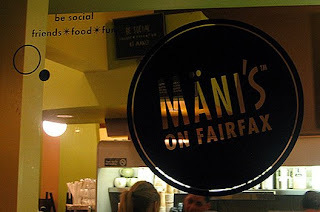 Mäni's is a wonderful breakfast and lunch spot, and its menu is marked as to what can be made gluten free and what already is! Some things (such as the burgers) aren't listed as being GF friendly but with a simple removal of the bun (or whatever the gluten offender is) can easily be made GF. The menu is filled with delicious options like omelettes, huevos over blackstones, fresh fruit smoothies, and great salads. In addition to marking the GF items on the menu, Mäni's also marks Vegan and Vegetarian options as such. Mäni's is also a bakery that carries some gluten free products. My favorite are the Peanut Butter Bites, which disappeared for a little while because of the peanut recall but I'm glad to say that they are being carried again! The peanut butter bites are deliciously moist and filling; it's hard to believe that they are gluten free. 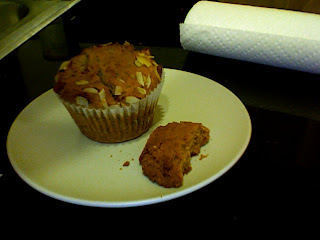 Today was also the first time that I got a taste of Mäni's Lemon Poppy Seed Muffins, which didn't disappoint. I've also had the Caramelized Apple Cake, another great GF option. Definitely call ahead to see if they have your favorite! The previous time I was at Mäni's I also had two celeb sightings: Chi McBride and Kathy Najimy. My friend was dying to profess his love for Kathy's role in "Hocus Pocus," but luckily I was able to restrain him from embarrassing me at my favorite breakfast spot. that would so not have been embarassing!!! 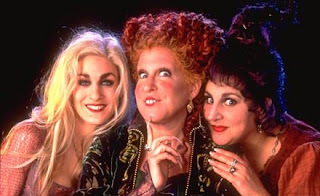 Hocus Pocus was a cute movie! Say hi next time and tell her about your blog!